Known as the city of cats because the name sounds similar to the Chinese for cats, somehow the wordplay has got out of control over the years. There are cats everywhere. Not cute fluffy real ones, but huge and sometimes quite scary statues of cats. They even appear on the metal drain covers ! For all that, it makes an exciting treasure trail to discover as many as possible. The sense of humor of Kuching residents is highlighted further as, when you think you have found all the cats, you spot a giant lobster on top of a car park! Like many towns, Kuching sits alongside a river. To cross the river there are taxi boats, usually manned by older men who live on the boats and charge only RM0.5 (U.S. 15cents/ UK 8 pence). I wonder how they will ever be able to retire. The boats wobble wildly as people get on and off and as seating is on benches, the cries of “argh!” and “oooh”‘attest to the need to choose your seat wisely as even weight distribution is essential. Crossing the river in a little boat, we visited the orchid garden. An amazing space, full of a massive number of orchids in flower along paths and walkways. Free entry and surprisingly few visitors, definitely underrated in our opinion and better than any orchid displays we have seen anywhere. Also across the river is a famous cake shop. We saw many of the Kuching cakes – known as Layer Cakes – along the streets, but it was the shop across the river, where the layer cakes were made into Swiss rolls, and whose boxes and bags were carried by the many out of town visitors to Kuching. The cakes are crazy colours, each colour being a different flavor. (We are told the colours are natural, but we remain skeptical.) People crossed the river, bought their cakes and returned back on the boat. We meet a couple from Singapore who were taking their supplies back home for family and friends. The food choices in Kuching are extremely varied. There are plenty of places serving food whose origins lay within Indian or Chinese cuisines. The giant lobster on the roof of a car park gets illuminated at night when the top floor becomes a fresh fish food court. So many food courts, so many restaurants, one of our favourites is the claypot speciality restaurant, near our hotel and always busy with locals. Sarawak has a chequered history, given to the British as thanks for assistance in crushing a rebellion, the British Colony was returned back to Sarawak in 1946, by the last “White Raja”. The fort, cathedral and governors house are among the remaining colonial buildings that dot the town. There are brass placards around town for a self guided heritage trail, starting at the riverside. The architecture in an interesting mix of colonial, Chinese pagodas and chop houses, a veritable mix of styles including the very modern. The Sarawakians are proud of their heritage and current cultural status and see themselves as better educated, more altruistic , healthier and fitter than their Malaysian counterparts, or so we are told by a chatty chap as we head out of town. I enjoyed the fact that a tree – over a hundred years old and a cotton tree – brings out such passion in Kuching residents, fiercely protected, celebrated and written about frequently in the local news, it sits on the edge of the plaza. We simply had to take a photo of the famous tree. 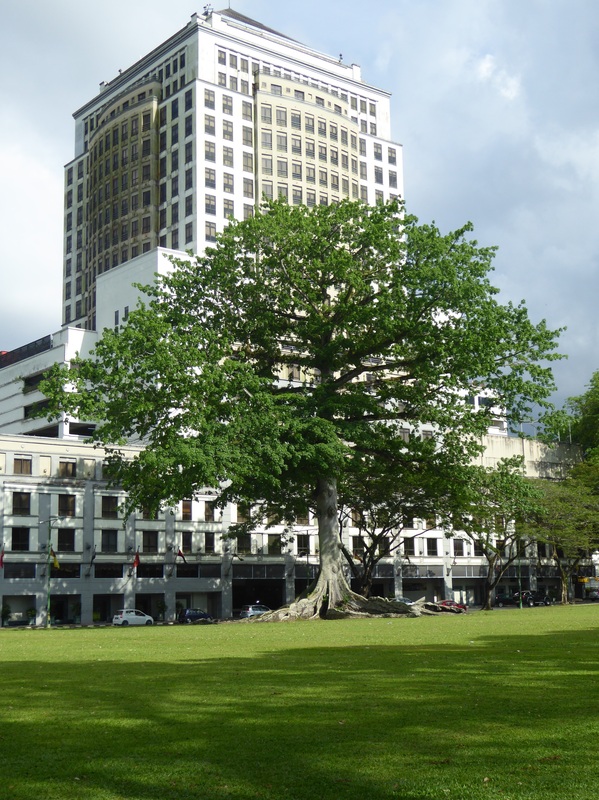 It is the largest tree in Kuching! Those cake use all natural colors I am told! This is Kuching, my hometown. Thank you, Carolyn for sharing. Thank you. I am looking forward to visiting again very soon. So beautifully shared. Thank you for sharing. My Hometown, Kuching, There is no where like home.